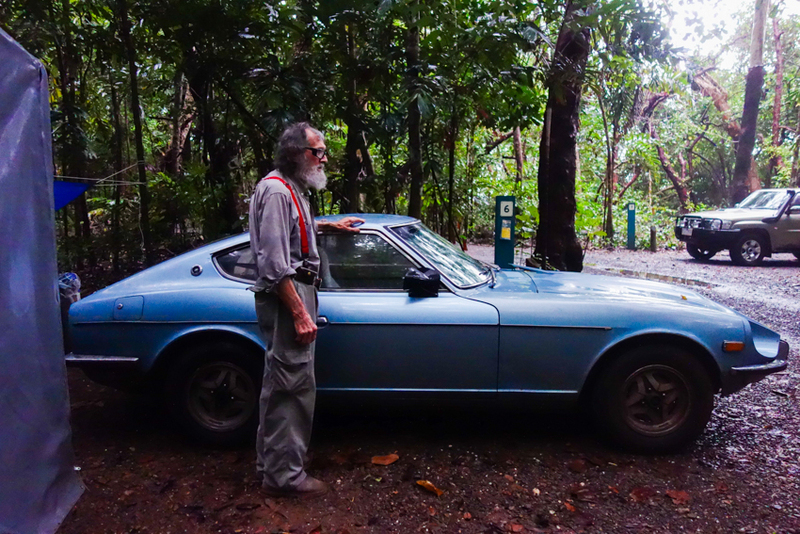 I got one of these Datsuns in the 60's brand new when I still had money. I sold it at some point but when I later on needed a car I looked every single ad but didn't like any of those cars. Finally I found this '76 model second hand. I've had this for 20 years now. The line is perfect, they got it just right. It's the most beautiful shape in a car ever made. I live in Sydney but it gets too cold in the winter. That's why I drive 2400 kilometers every year here up north into wet tropics of Cairns and Daintree . I'm here long-term but the rangers don't like people staying for too long. I'm here five weeks, then switch to another place for a month. Then I move back here again. I went broke at some point and now live on a government's pension, 860 dollars fortnight. The trick is not to spend more than you get. I'm 85 so I don't have much time left any more. I was born in the 1930 but conceived on 1929 on my father's birthday. How about that? I have kids and I've been married but life has turned in a way that nowadays I'm alone. Some years ago I went driving and camping for ten days with another bloke but that didn't work out so I prefer to do this alone. I have siblings which are no longer with us and those who are left don't want that much to do with me. I'm used to it. It gives me all the freedom in the world. So what's your biggest dream? Maailmaan mahtuu kyllä yhtä monta mielenkiintoista tarinaa kuin on ihmisiäkin. Keith vaikutti kyllä kaikin puolin tyytyväiseltä elämäänsä, mistään katkeruudesta ei ainakaan ollut tietoakaan.